Planning a trip to the Bay Area? 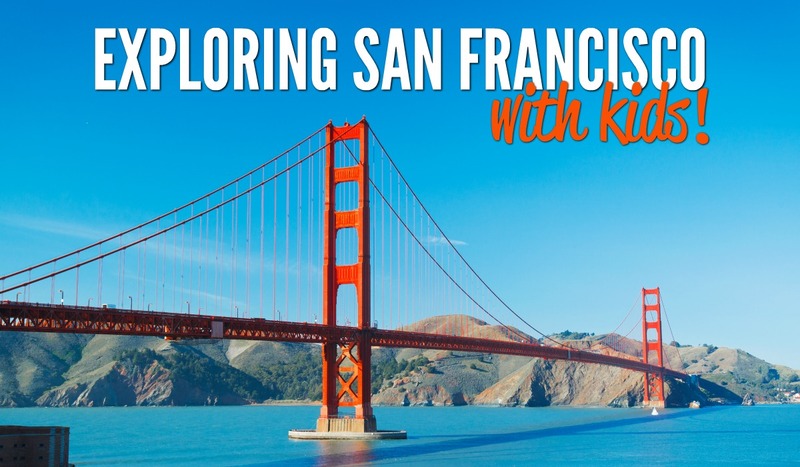 Don’t miss these awesome activities in San Francisco with Kids. See what’s free or worth the ticket price! A few months ago we took a family trip to San Francisco. 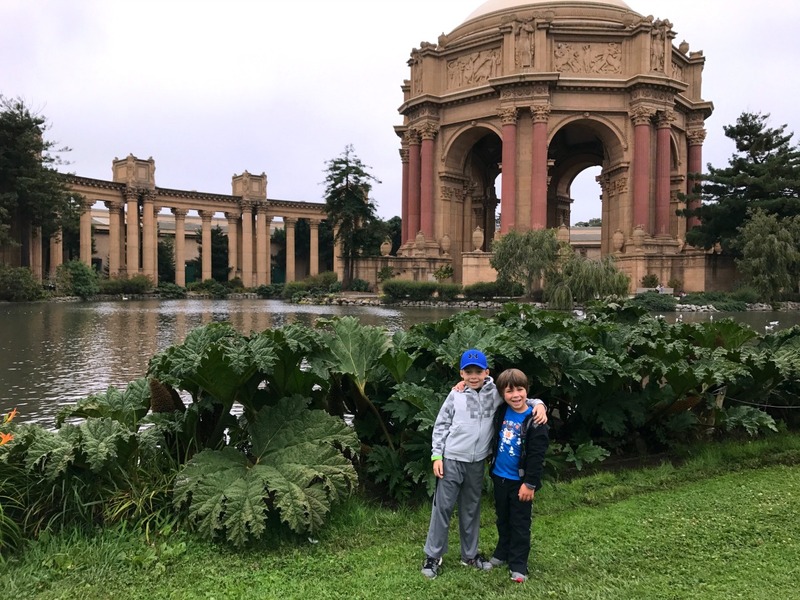 I scoured the internet looking for the best things to do in San Francisco with kids and made a list. I tried to incorporate kid-friendly activities into some of the adult activities my husband and I planned to do. Also, since the city is so expensive, I wanted to make sure that a bunch of items on the list were free or inexpensive to help us have fun, within our budget. We also discovered a few things while we were there. I think it’s really important to have some wiggle room in your itinerary so if you come across something that looks fantastic, you can actually stop and enjoy it! 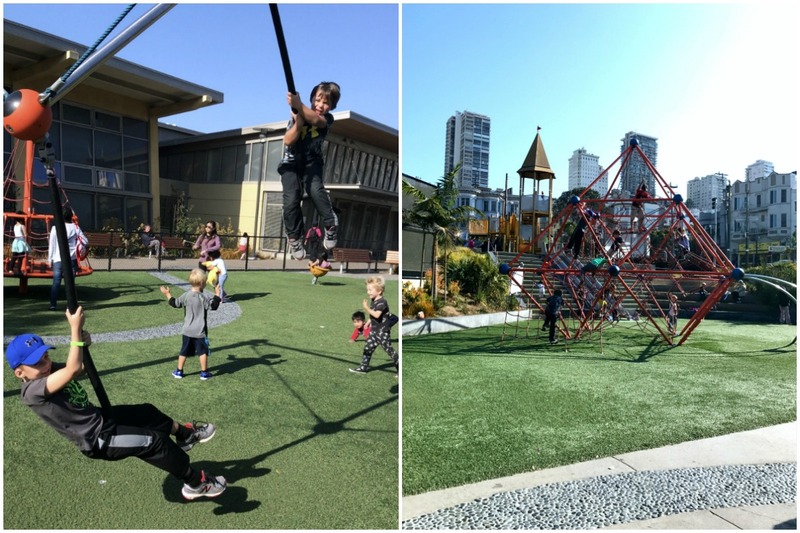 After exploring most of the city and seeing what our kids loved most, here are our favorite activities in San Francisco with Kids. The Palace of Fine Arts is a monumental structure originally constructed for the 1915 Panama-Pacific Exposition in order to exhibit works of art presented there. Currently it is one of only a few surviving structures from the Exposition. Now the Palace of Fine Arts houses a theater but the grounds are a wonderful place to spend a few hours. We walked all around the grounds. The boys played hide and seek and tag. We saw other families enjoying picnics and feeding the ducks. The structure itself is beautiful and while the kids ran and played I got to enjoy the grounds too. I love that there are so many places that adults can enjoy despite being in San Francisco with kids. Another perk was that we had a pretty easy time finding parking too. I don’t know if it’s that easy every day but lots of open spaces surprised us! This little park was one of my kids’ favorite activities while we were in San Francisco. They begged to go back! Seward Mini Park is a tiny little gem tucked away in The Castro. It contains a small community garden and a pair of very steep, slightly windy, concrete slides. You sit on a piece of cardboard to slide down. There’s usually plenty of cardboard at the bottom you can use, or bring your own. Rumor has it you can spray the bottom of your cardboard with cooking spray to really go fast. However, my kids were flying on them as it was and I didn’t want to give them any ideas! Keep in mind these slides aren’t for tiny tots. A sign posted at the bottom of the slide said adults need to be with a kids to slide, though we saw a bunch of adults going down without kids. It’s a pretty steep climb up, especially for little legs. We found it’s easier to go up the hill closer to the houses than up the path next to the slides themselves. We spent nearly an hour here and probably could have stayed longer! San Francisco’s Cable Cars are one of the most iconic attractions in San Francisco. Since there’s really nothing else like them, it’s a must-do for families. My boys had such a great time riding the car. You might get lucky and get a friendly conductor and empty car. Our conductor explained to the boys how it operated and he showed them how to pull the lever. They really enjoyed it! 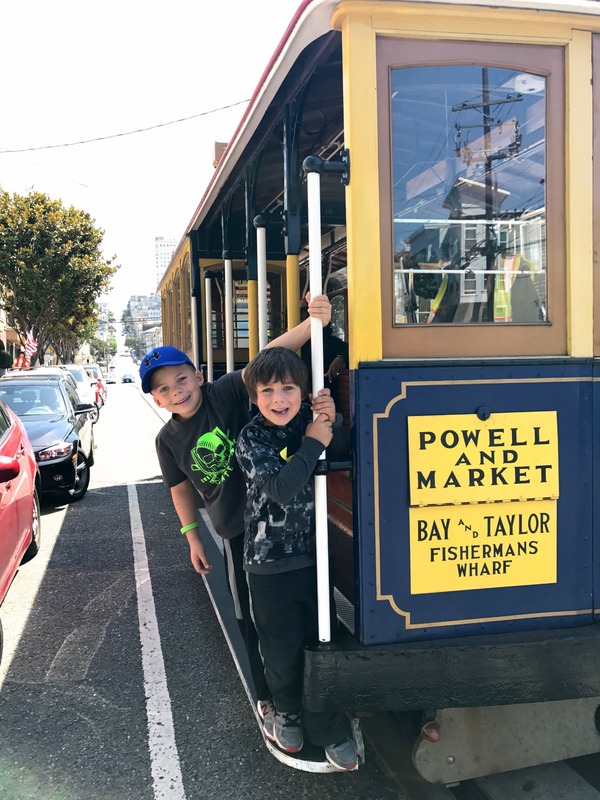 If you are headed to San Francisco with kids, the cable cars are a must! We had a San Francisco CityPass which allowed us unlimited transportation on all Muni trolleys, buses and historic cable cars for three consecutive days. But regularly the tickets are $7 per person. At the end of each route you can buy your tickets and hop on the trolley to ride the full length of the route. However, the lines are really, really long. We walked up one stop from the beginning and the line was much, much shorter. The Rocket Boat is definitely one of the more touristy attractions we did. I normally wouldn’t have considered it but the San Francisco CityPass has a ticket for either the Bay Cruise Adventure or the Rocket Boat. Since we were already planning to go to Alcatraz, we thought the Rocket Boat would be something different. And boy was it! 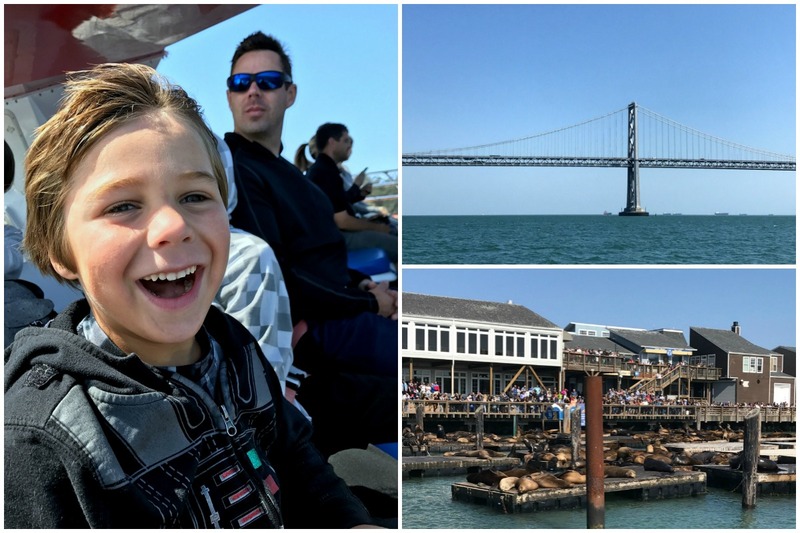 This was a thrilling speed-boat tour on San Francisco Bay and gave us some great views of the city, the Oakland Bridge and even the Fisherman’s Wharf seals! Be prepared! Depending where you sit on the boat, you might get a little wet. We asked to stay dry and our seats only had a little bit of spray. The boys were grinning ear-to-ear the whole time and we really enjoyed it. If you’re up for doing something thrilling and don’t need to see the Golden Gate Bridge from the water, then try this tour. We were really glad we did! We saw the Joe DiMaggio Playground from the Hop On/Hop Off Bus and it looked so neat that we planned a trip back later that day. It’s within walking distance of Coit Tower, Fisherman’s Wharf and Lombard Street so it’s easy to stop by when touring other places. The playground is pretty large for an inner city park. I loved the fence surrounding the playground and with only one gate, you can let the kids run wild without fear that they will end up wandering down San Francisco’s streets. It underwent a huge renovation a couple years ago and the equipment is really neat. 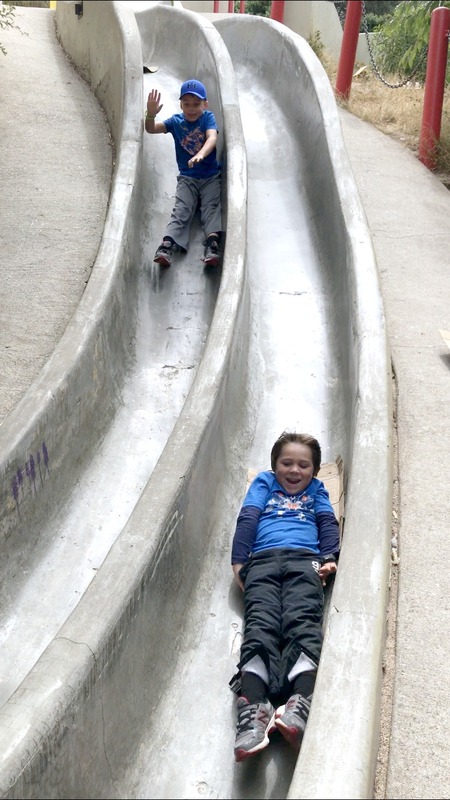 Of all the parks we came across, I think this was probably the best one to visit in San Francisco with kids in tow. Of course there is a playscape and jungle gym but there is also a really cool swing my boys loved. There’s tons or room to run and play. My husband and I enjoyed a snack at one of the picnic tables and watched the boys play. 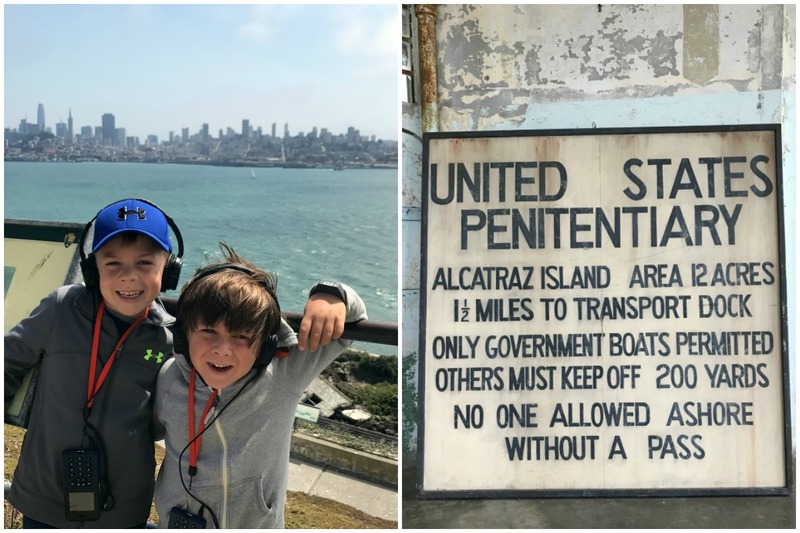 Alcatraz Island was another tourist attraction that our kids really enjoyed. We started out with great views from the ferry to the island. Once there, we started at the info center and grabbed a Junior Ranger Book for the kids to complete on our too. This was a great supplement to the audio tour and helped the boys learn about the history of the island and the natural environment and habitat there. While the audio tour is not geared towards children, it was simple enough that my boys paid attention and followed along. They found the accounts of the escape attempts really cool and enjoyed learning about the different things in the cells. If you are planning to visit Alcatraz, tickets can be purchased up to 90 days in advance. They often sell out because of the limited number of visitors allowed on the Island each day. If you are planning to visit during peak tourist times, purchase your tickets well before your trip! It’s expensive but I thought it was worth it and the boys had a great time and learned quite a bit. 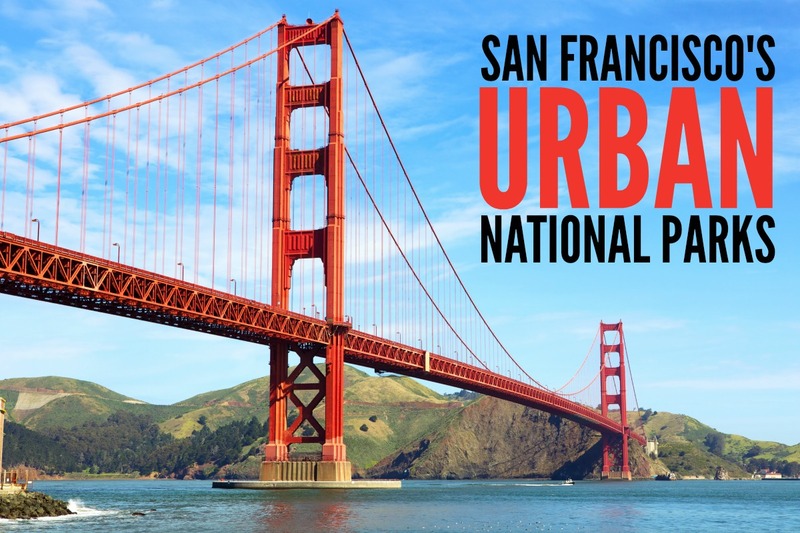 While our family enjoyed these fun activities in the heart of the city, there are so many wonderful, kid-friendly activities and attractions in and around San Francisco. If you are traveling to San Francisco with kids and need more ideas, don’t miss these other great adventures for families. Please share your favorite things to do in San Francisco with kids. We have good friends that live in the Bay Area so we will be back again soon. I’d love to check out some new things!